Mother’s Day Gift Ideas ~ Think Pink! Looking for something fabulous for Mother’s Day? Whether you are buying for yourself or buying for your mom here are 5 gorgeous finds, all in pink! What I’m loving about the new season’s pink is that it isn’t Barbie-pink. Its pretty, super flattering to skin tone, and you can be a fully fledged adult and still wear it! 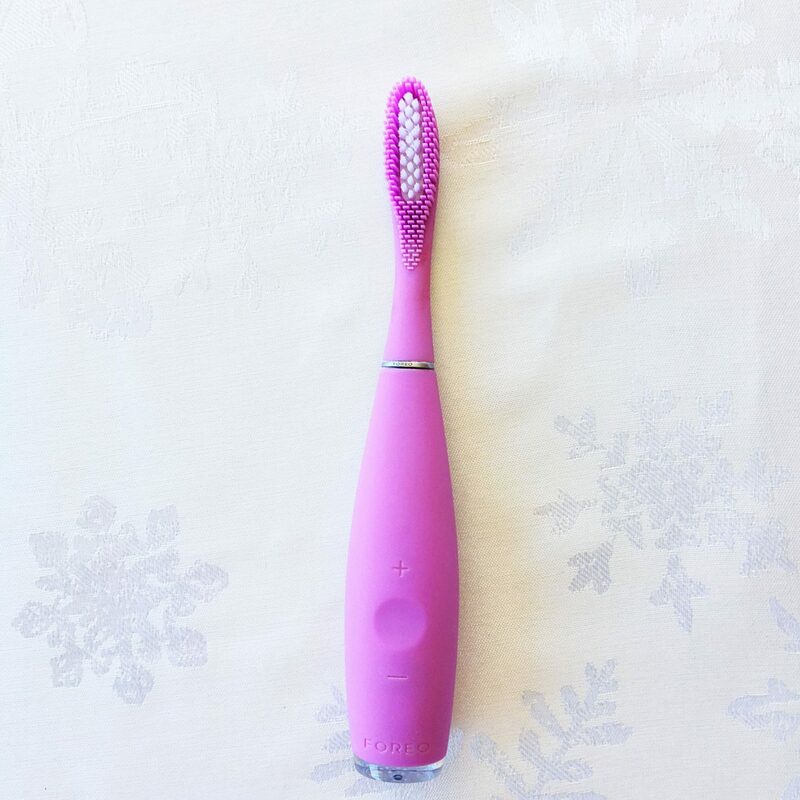 Here are some really wonderful gifts for mom in pink. (I know they’re wonderful because I already bought them for myself!) This post contains affiliate links. Every year I buy a new pair of Superga sneakers to wear on my Glam Italia tours, not because the old ones are worn out, but because they come in so many fabulous and fun colors and I can’t justify buying multiple pairs in one year. I have grey, black, royal blue, hot pink, and now this year I bought pale pink. Supergas are the super cool sneaker that every it-girl in Europe seems to wear. They are chic, look good with everything, are incredibly comfortable, and you can walk or stand all day in them! If you are buying Superga sneakers for Mom for Mother’s day you can find them on Zappos.com (free shipping!). They are absolutely true to size so you can safely order them as a gift. 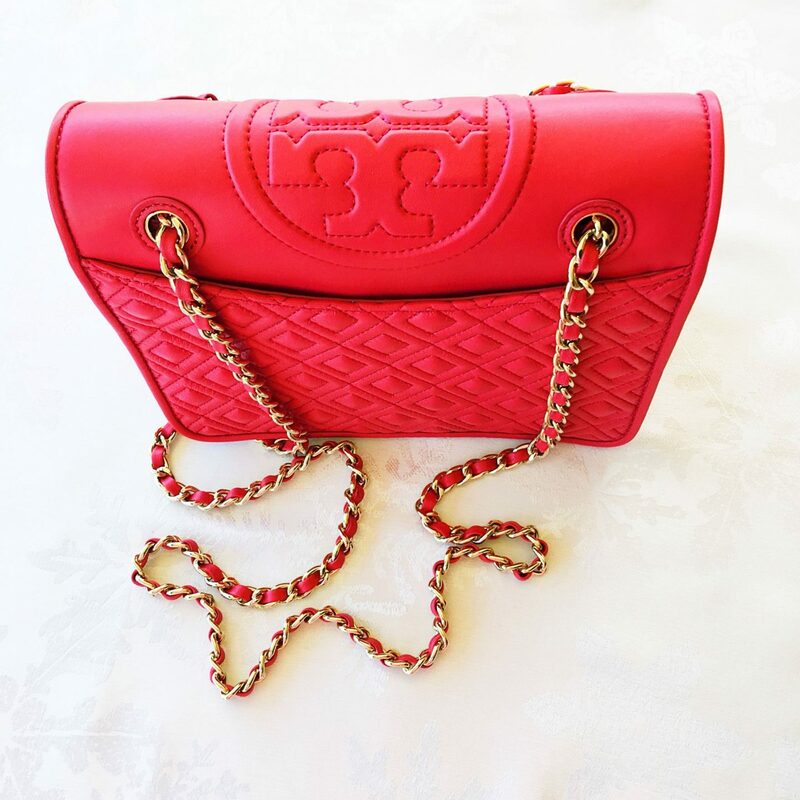 The Tory Burch Fleming bag in pink is my new favorite thing! The color on my bag didn’t photograph well – it’s actually a really pretty, hot pink. I love the quilting on this bag, the chain strap that can either be worn as a cross body bag or as a regular shoulder bag (making it perfect for travel!) and the size of it. The Fleming is neither a giant, heavy bag, nor a tiny bag. You can comfortably fit your sunglasses, wallet, phone and makeup bag – my personal requirements- in there. Nordstrom.com has a great selection of Fleming bags, including a pale pink one that I didn’t see when I ordered mine. 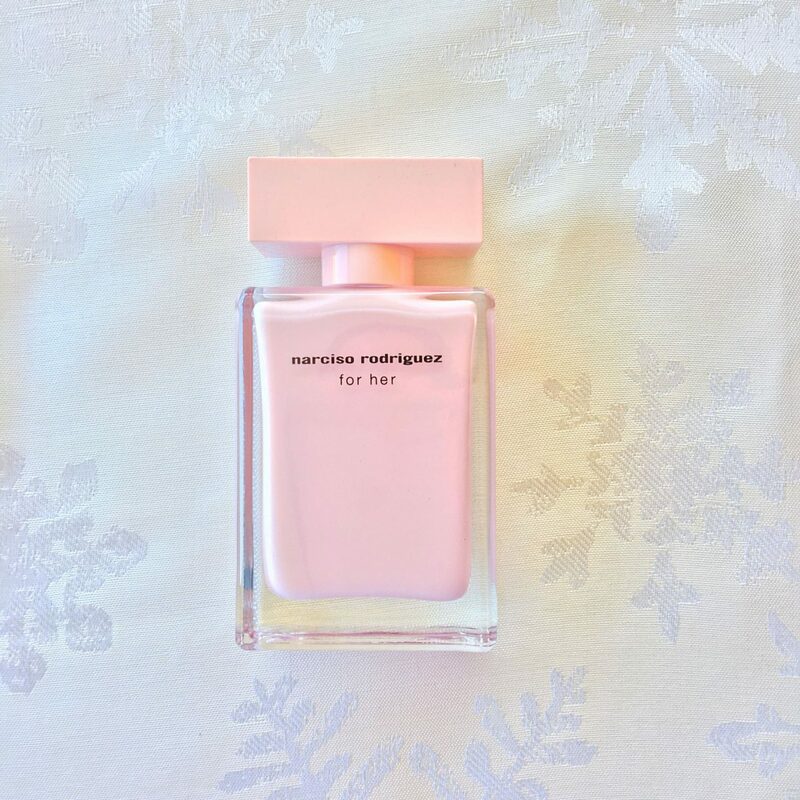 Narciso Rodriguez For Her Eau de Parfum. I have worn this fragrance for years. I first discovered it during a layover at Paris Charles de Gaulle airport on my way to Florence. I sprayed it on one of those white fragrance cards and threw it in my handbag, and then for the rest of my trip every time I opened my bag the fragrance would waft up at me. 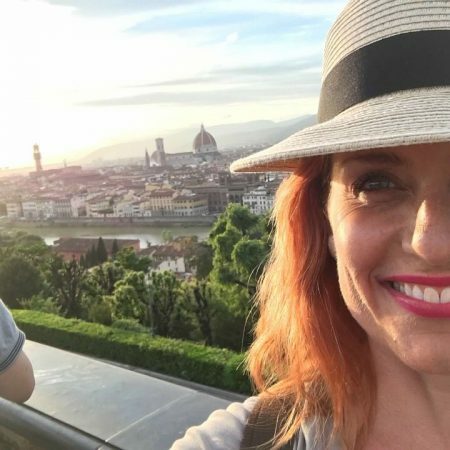 In Florence I found a Sephora and bought it, and have worn it ever since. Every time I spritz in on I think of Florence. Next week I’m heading down to Belize for a few days. I love it when makeup jobs fly me off to cool destinations! 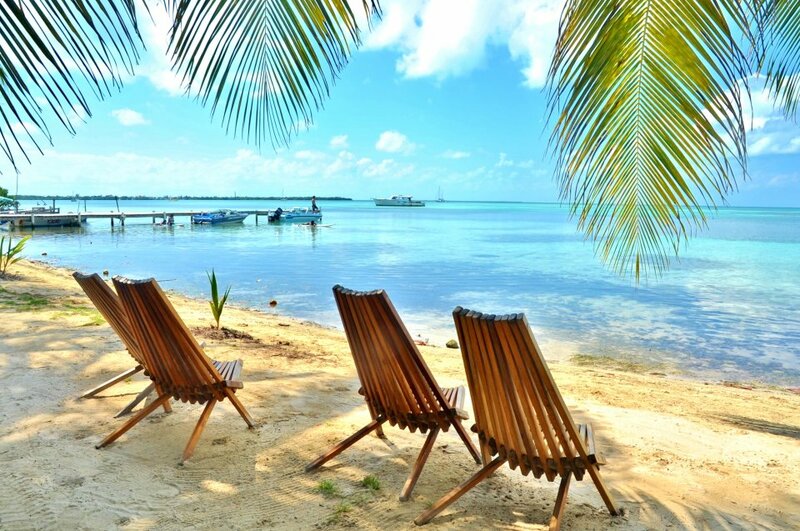 I’ve never been to Belize before, so not only is this totally cool, but we are going to be on an island called Caye Caulker, with palm trees, white sand beaches and an endless ocean. I can barely wait! I will have some down time while I’m there, and fully plan to not only get well acquainted with the beaches but also to do some snorkeling. The world’s second largest barrier reef is off the coast of Belize. The last time I went snorkeling I was on the world’s largest barrier reef off the coast of Far Northern Queensland in Australia, so this is going to be incredible! 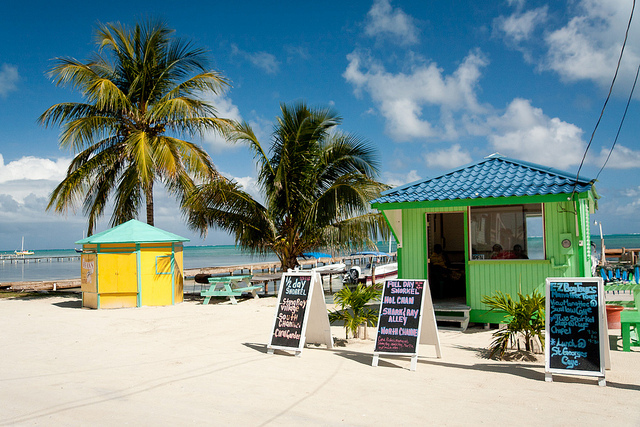 I foound these images of Caye Caulker on google – they’re not mine, and there are some affiliate links below. 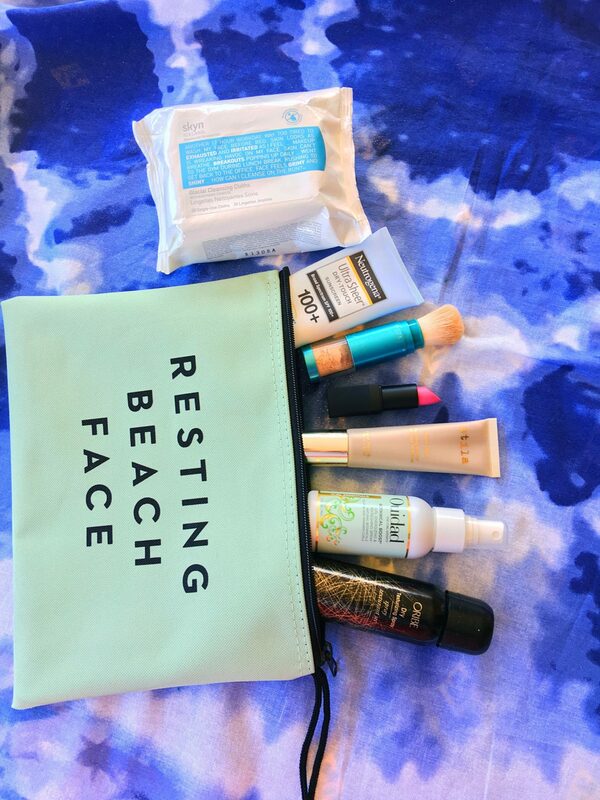 Right now I’m figuring out what to pack and I’m going to be using some of the things I received in my Spring 2017 Fab Fit Fun box. At the beginning of each quarter they send you a gorgeously curated box of fabulous things that you need to be chic for the season ahead. In my spring 2017 box there was this cool Gypsy Roundy, a round cloth that you can use as a beach blanket or picnic blanket, a table cloth, a wall hanging – tons of uses. Mine came in the tie dyed looking blue and white print, which is pretty cool for beaching it, don’t you think? This is it below with my beauty products sitting on top. I also received this cool Milly Zippered Pouch, which you can use as a clutch, a travel makeup bag or as I plan to use it, a beach bag. It’s water proof inside so you can throw in a wet bikini, but I’m using it to store my beach skin and makeup needs. Sunscreen needs to be reapplied during the day, but I hate getting gritty sand on my hands and in my sunscreen and roughing up my skin, so for years and years now I have been using ColoreScience Sunforgettable Brush On Sunscreen SPF 50. This is genius because you can reapply it over your makeup and not mess everything up, and if you are feeling a little more glowy than you want, the powder formula can matte you down too. It’s fantastic! When the beaching is done and everyone is heading out for dinner or drinks and there’s not time to go home and get showered I like to clean my face with Skyn Iceland Glacial Cleansing Cloths and then use a refreshing facial mist to both sooth and hydrate my skin without having to deal with gooey moisturizers. Sephora has tons to choose from. One of the best ways to look fab after the beach, especially if you are a little more red than planned, is to neutralize your complexion with a little bronze. Powder bronzers can get too grabby on your skin and look weird, and most powder bronzers have too many glittery, flickery particles in them, which makes your entire bronzer game look ridiculous. 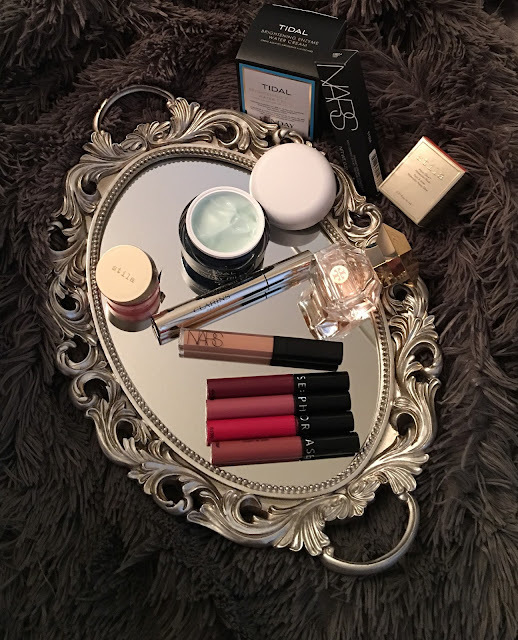 I prefer to use a gel bronzer, and my favorite is Stila Aqua Glow Perfecting Gel Bronzer. 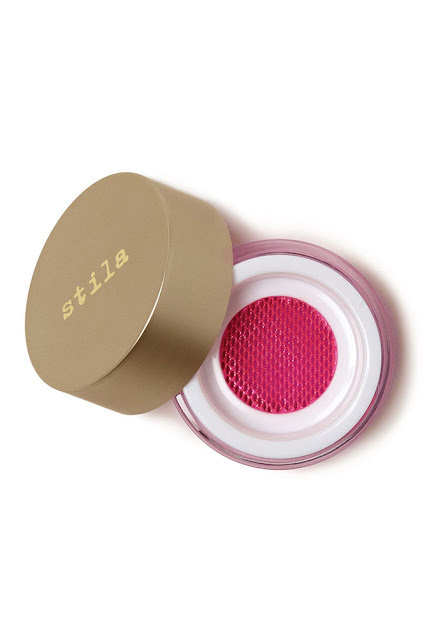 I typically can’t find this product in stores so I always order it on Stila.com)After a day on the beach just tapping a little gel bronzer along your cheek bones and a little at the edges of your forehead can make your skin glow, and knock down any excess redness. In general I don’t take perfume to the beach, but if I have a little travel sized bottle I slip it in my bag. Perfumes aren’t supposed to hang out in the heat as this can ruin them, so don’t bring a big bottle! I’m naturally curly, and although most of my life is lived with my hair smoothed out, I don’t even consider it when beaching. Left to it’s own devices my hair will look like a cross between a really bad home perm that went drastically wrong and an afro. For a quick hair repair I spritz in Ouidad’s Botanical Boost Refreshing Spray which I get in the travel size, and I normally rake and shake a little of their Heat and Humidity Gel through as well. 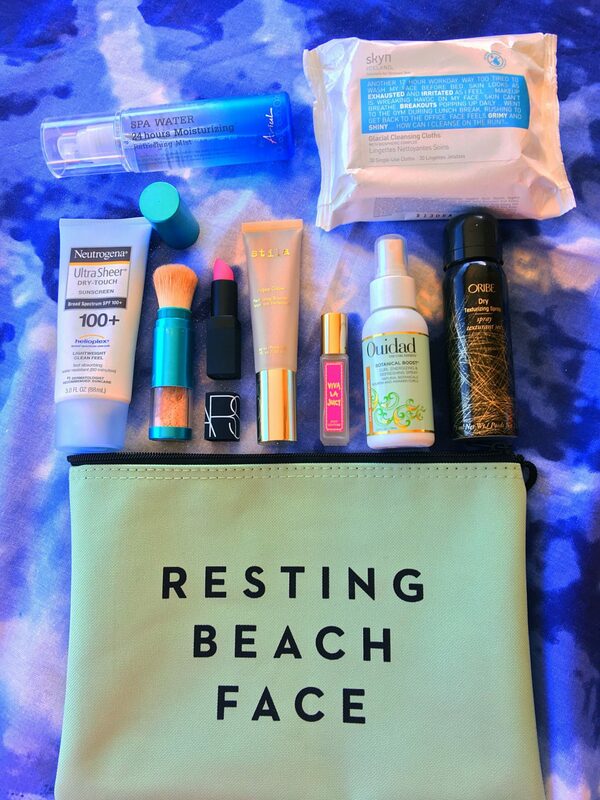 I also buy that in travel size and am waiting for my order to arrive, so it’s not pictured here. Last but not least if my hair is collapsing at the roots, which happens all the time, I spritz a little Oribe Dry Texturing spray. I order all my travel sized Oribe products from SpaceNK.com Sometimes I use a dry shampoo, but I find a dry texture spray has a few more uses and is therefore a better travel companion. And it smells amazing! I’m always being asked about my favorite things. I was given some amazing products in the lead up to Christmas, and I bought some really great items, and some of it got lost in the holiday madness and didn’t make it to the blog, but today I want to show you an assortment of my absolute favorite beauty items of the moment. I have been hearing so much about Sunday Riley products for a while now. My winter Rachel Zoe Box Of Style had a full size jar of Sunday Riley’s uber celebrated Tidal Brightening Enzyme Water Cream. This is the cream that everyone is raving about and I can totally see why! This is a next generation super hydrating cream that holds water and nutrients to the skin, plumping it up and making it look youthful, all the while brightening it and getting rid of that dull, lifeless winter complexion. It is really, really fabulous. 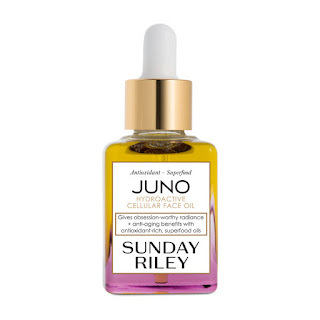 I seriously want to try out the Sunday Riley Juno Hydroactive Cellular Face Oil which I hear is just amazing. It’s going to be the next new skin care product that I buy. 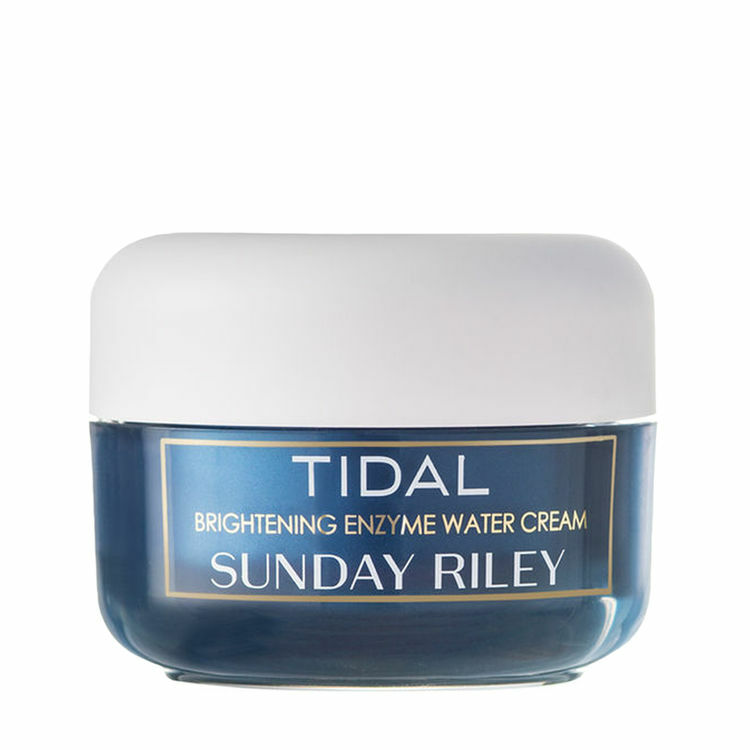 You can find Sunday Riley products online at Space NK. From my Bloomingdale’s Beauty Box, which was a birthday gift from Bloomingdale’s, I fell in love with the new Tory Burch fragrance, Love Relentlessly. I have worn it every day for the past month and just adore it. It is pure romance. Bloomingdale’s also gave me my new favorite mascara too. It’s from Clarins and is called Supra Volume Mascara. In it’s tube it is quite unassuming, and I really thought it would just be a “nice mascara”, but this one is an absolute powerhouse lash builder! It makes my lashes huge, but not gunky. They stay defined, separated, long and thick all day long. I am convinced that Supra Volume Mascara is the french girl’s secret weapon. I was sent so many mascaras last year, most of which I never wrote about as I only talk about the products I love. This one is the real deal. I am always looking for concealers that I can love. Most either don’t hold all day (my days are looooong! I’m constantly leaving home at 8 am and not getting back til 11 pm) or they are too heavy, which just makes you look old and tired, or they don’t color correct out the dark shadows well enough. 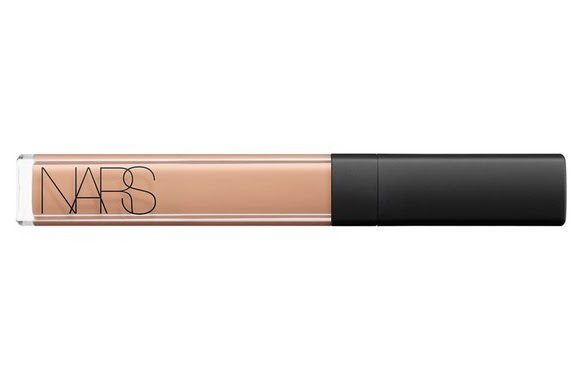 I am obsessed with Nars Radiant Creamy Concealer. I bought mine at Nordstrom before Thanksgiving and have worn it every day since. My shade is Honey, but they have tons of them, all calibrated with different undertones to color correct out your under eye demons. (10 I think?) They also have a fantastic color selection, so you can be the palest girl or the darkest goddess and they still have you covered. They don’t crease, have a luminous finish that bounces light off, making your eye look refreshed, last all day long, and frankly are the best concealers I have used in years. Love. From Stila I have been enjoying Aqua Glow Watercolor Blush. The colors are fresh and pretty and the product is buildable. I love really glowing, gorgeous complexions so often I find that powder blushes can either look heavy on the skin or deaden the glow. This one breathes life into the skin and gives it a gorgeous radiance. 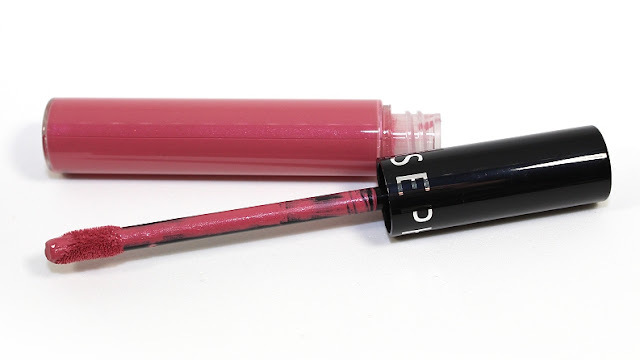 Lastly, my new favorite lip product is Sephora’s Lip Stain. They have a creamy texture but a matte finish, the colors are fabulous, and they only cost $14!! Every time I walk past a Sephora I go in and buy another one. They are gorgeous!